Britain’s players suffered a disappointing day two at the Australian Open as Heather Watson, James Ward and Kyle Edmund all lost. Ward, the British number two, came closest to victory but went down 2-6 6-0 7-6 (8-6) 6-3 to Spain’s Fernando Verdasco. 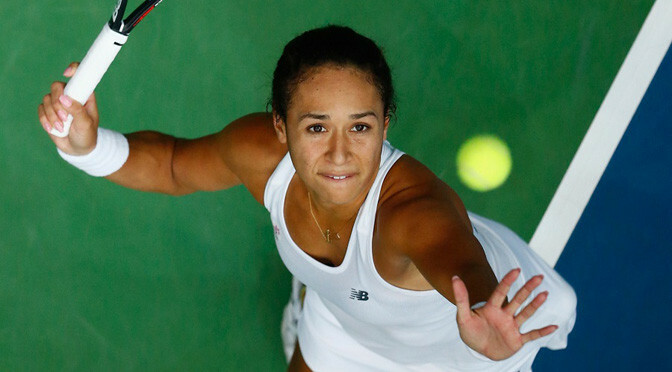 British number one Watson struggled with illness in a 6-4 6-0 loss to Bulgaria’s Tsvetana Pironkova. Also in round one, Edmund lost 6-4 6-4 6-3 to American Steve Johnson. Andy Murray is the sole British representative left in round two of the singles draws after beating India’s Yuki Bhambri in straight sets on Monday. Ward, 27, had his chances on a blustery court seven when he led by a break in the third set and then had a set point in the tie-break. After two similarly one-sided opening sets it was the closing stages of the third that proved decisive as Verdasco, the 31st seed and a former semi-finalist in Melbourne, recovered the break and served his way out of danger in the tie-break. A dispirited Ward thumped a forehand long to drop serve at the start of the fourth and although he fought hard to recover, the Londoner could not convert the one break-back point that came his way. “It’s come down to one or two points,” said Ward. “It was tough but I thought I played well. Ward will now head back to London where he will attend the funeral of his grandmother, who passed away recently. “I don’t want to make excuses but it’s difficult. We’re a very close family and it was a bit of a shock,” he added. Ward became the third British player to fall in a matter of hours afterWatson had succumbed to Pironkova , and a recurring ailment that saps her energy. The British number one required treatment from the doctor in the first set on court 10 and lost the last seven games. “It’s really frustrating,” said the 22-year-old, who still plans to play doubles in Melbourne. Over on court 22, Edmund faced a man ranked 154 places higher at 38 in the world, and the gap in class and experience told. Edmund, 20, had broken new ground by coming through three rounds to qualify for a Slam but made little impact on Johnson’s impressive serve. One break was enough for the 25-year-old American in each of the first two sets and two more followed as he clinically saw out the third. “There wasn’t a lot of rhythm due to the fact that he was serving really well,” said Yorkshireman Edmund. “It’s just something I have to take away, work on and use as a stepping stone to get better. 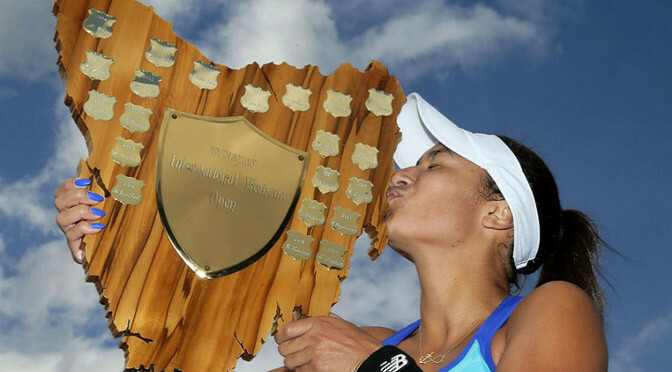 Heather Watson has become the first British woman since Anne Hobbs in 1985 to win two WTA Tour titles after she beat Madison Brengle 6-3 6-4 in the Hobart International final. 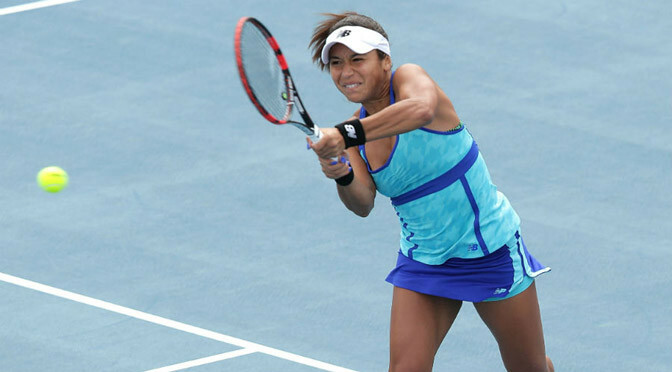 Watson, who won her maiden title in Japan a little more than two years ago, recovered from 3-1 down in the first set against the American qualifier to complete an ideal week of preparation for the Australian Open, which gets under way on Monday. The result means Watson is up to a career-high world No.38. Watson now heads to Melbourne for the year’s first grand slam, where she will play Bulgaria’s Tsvetana Pironkova on Tuesday. Watson will be Britain’s only female representative in Melbourne – and there was mixed news from men’s qualifying as Kyle Edmund made his grand slam in dramatic fashion, while Liam Broady fell at the final hurdle. 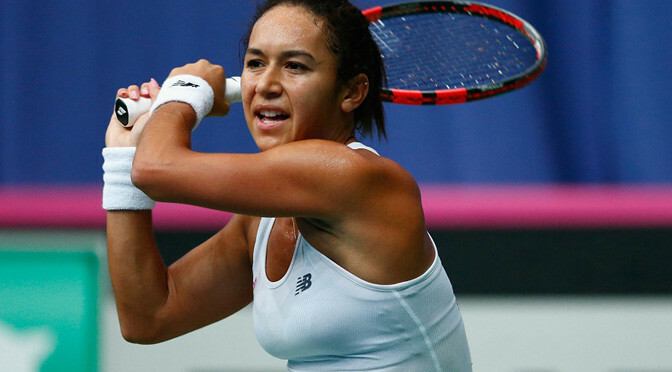 Heather Watson is one win away from her second WTA title after reaching the final at the Hobart International with a straight-sets victory over Alison Riske. 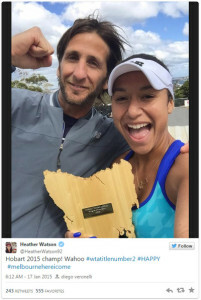 The British No.1 and Riske, who at No.42 is ranked seven places above Watson in the world standings, were forced off the court at Domain Tennis Centre in Tasmania six times due to rain – including once at match point. But Watson eventually prevailed 6-3 7-5 to advance to the final, where she will play another American, Madison Brengle, who beat Japan’s Kurumi Nara 6-4 1-6 6-3. “I’m very happy to finally get through today,” Watson told reporters. “It was tough. Watson recovered from 3-1 down in the opening set to win the next five games and also came back from the same deficit in the second. Then, leading 5-4, Watson let her first two match points slip but had just set up a third when heavy rain forced the players off once again. The delay lasted an hour and it was hardly surprising that Watson served a double fault when play eventually resumed. She followed that by losing the next two points and her serve. But the 22-year-old promptly broke Riske’s serve to lead 6-5 and this time served out for a place in Saturday’s final against former leading junior Brengle, who is up to a career-high world No.84. Watson will be looking to add to her first WTA victory, which she picked up in Japan two years ago. 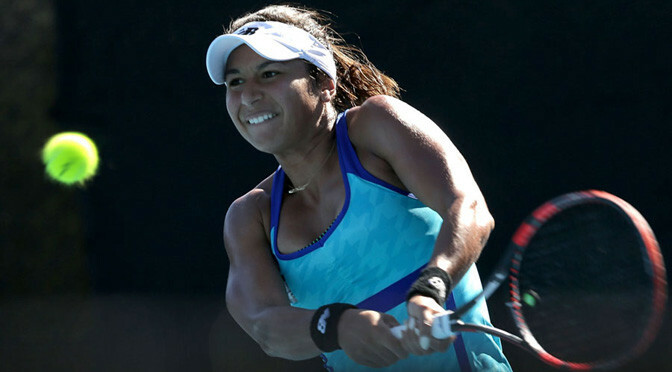 Heather Watson continued her recent spell of good form with a straight sets victory against Sloane Stephens to reach the last eight at the Hobart International. Watson prevailed with a 6-3 6-1 triumph in little over an hour on court and now faces Roberta Vinci in the quarter-finals. 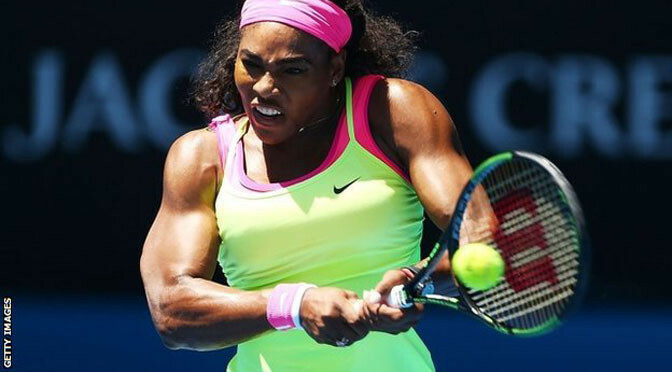 Watson has been in fine form the Australian Open, which begins on January 19, fast approaching. The Briton comfortably beat Magdalena Rybarikova in straight sets in the opening round to set up her clash with Stephens. 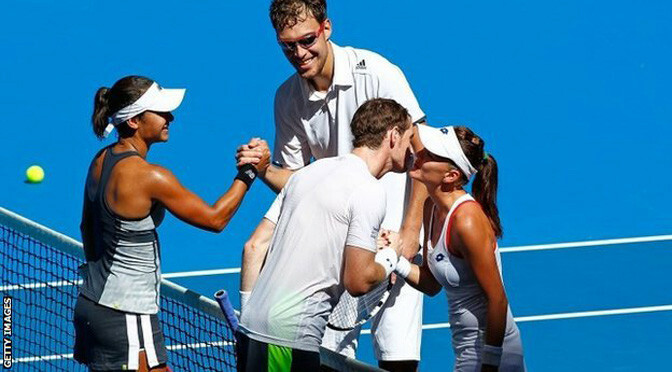 Last week, Watson partnered Andy Murray as Great Britain beat Australia 3-0 in their final Hopman Cup fixture. However, Team GB were pipped to the final by Poland, who then went on to beat United States for the title.